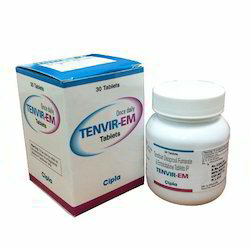 Emtricitabine is also marketed in a fixed-dose combination with tenofovir (Viread) under the brand name Truvada. A fixed-dose triple combination of emtricitabine, tenofovir and efavirenz (Sustiva, marketed by Bristol-Myers Squibb) was approved by the U.S. Food and Drug Administration (FDA) on July 12, 2006 under the brand name Atripla. Emtricitabine makes up one fourth of the Quad pill (brand name: Stribild).